As I hope you noticed, I posted a new subscription form on the website, for a weekly game e-zine, which I thought of as a separate newsletter to this one, a rather special weekend edition. However, the system I’m using doesn’t allow me to have two separate lists of subscribers, so I would have to send two e-zines to the same people, which I’m trying to avoid due to spamming regulations. So, I thought of the alternative of integrating the idea of an educational game into this e-zine, since some of you have already asked me for something funnier than the usual lessons. - Do you think we should replace the Website Design Section and keep the other lessons going? They would be Writing and Grammar. Please feel free to vote by replying to this email, for the duration of one week. I shall then announce in our next session, which way was more popular and take the appropriate action. Thank you for your cooperation on this matter. Show me you care about what I’m sending you - I look forward to hearing from you. Last time we spoke about intensifying adverbs and modifiers and I hope you’re still applying this in practice. Today we shall continue with intensification strategies, this time for questions and negatives. Before we go into the mechanics of this, let’s talk a little bit about ‘wh-‘ questions. A ‘wh-‘ question is just that – a question asking for some information about something. However, like any question (or statement, for that reason), we also have the emotive aspect of it, meaning the emotion the speaker/writer is adding to the message. It is this aspect we are intensifying, when we use the following tactics, either in speech or in writing. NOTE: When you see ‘ever’ as part of the word, as in ‘whoever’, ‘whatever’, ‘wherever’, they mean something else – they are not used as intensifiers. Having said this, you should also note that ‘why ever’ is always spelled as two words. Now, if you remember the term ‘operator’ (being the auxiliary or helping verb forming the verb phrase), you shall notice that this is placed before the subject (‘did’ and ‘have’). - registering a website with the SBI system that I’m using. Today we shall start the third and last main aspect of website design – the actually DOING it stage. I bet it will be exciting, although I am waiting for people to confirm that you are actually interested in learning about it. As you may have read in the introduction, you need to email back and vote on whether to keep this section of our e-zine going, or replace it with the weekly vocabulary/grammar game we’re starting. The choices are between [grammar + website design + a game] or [reading/writing + grammar + a game]. Please indicate your options on this voting form. #1 Your visitor must get the best information you can give them. OVERdeliver with original, high-value info. Keep in mind what your visitors seek... they are notlooking for your business. Your job is to provide quality info that reinforces in your visitor's mind that you are an "expert" they can trust... and one who can grant their wish or solve their problems. If you don't do this, they simply click the back button to the Search Engine and say... "Who's next?" #2 Search Engines are in business, too. Their product is the quality of their search results. Let's say, for example, a Web surfer searches for "salami." A Search Engine wants to deliver the most relevant "salami sites" on the Net. If you do anything to hurt their product (i.e., the relevance and quality of their search results), sooner or later they will hurt you. But when your site provides what searchers want, you add value to a Search Engine's product. As a result, searchers will trust this SE to find the best information next time as well. That is the big win for Search Engines. A growing loyal base of users makes it easier for them to attract and keep advertisers, their real customers! • OVERdeliver to your visitor. This ensures repeat visits, confidence and trust and likability ("PREselling")... and growing chances to monetize. • Please the Search Engines. Do it right and they will never ban you. Better than that, as your site grows, and as humans respond positively to your site (something they track more and more efficiently, in hundreds of ways), they reward you with higher & higher rankings. #4 Your advertisers and merchant-partners must win, too. For example, let's say that you plan to participate in the Google AdSense program. By focusing each page clearly on one topic, Google will be able to deliver contextually relevant ads. That makes Google's advertisers happy. Welcome to our first "Game of the Week session! I hope we'll all enjoy some fun and learn a lot from the pleasure as well. 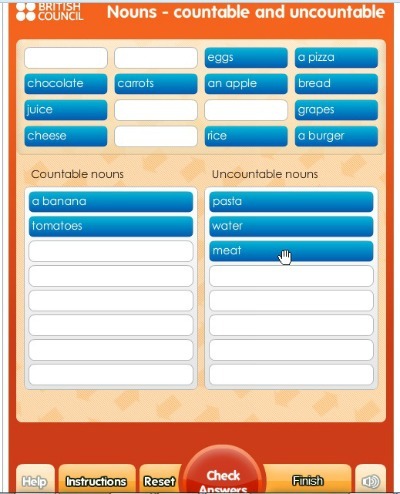 The first game I chose for us is a vocabulary game, on the category of nouns. Worse: countable and uncountable nouns. What you need to know is that countable nouns are the ones you can count (you can use 'one', 'two', 'three' & 'many' with them) and the uncountable nouns are those you cannot count (you can only use 'some', but not numbers or 'many'). Sorry, I don't have the link for this website programmed into my SBI system right now (my task of correcting exam papers distracted me today), but it will appear as a legitimate link in the back issues - I shall complete that operation soon after posting this e-zine to you. # 1. The first game is a kind of 'pick and drag' to fill in the gap to finish the sentence correctly. 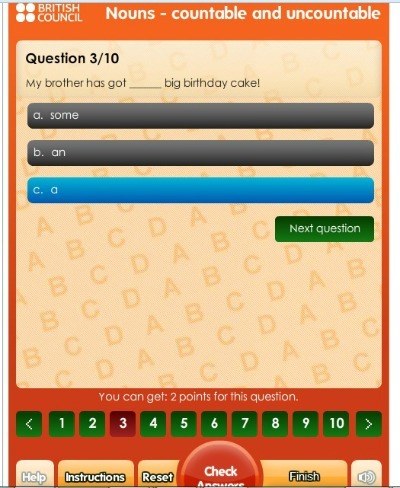 You have 10 questions and at the end you can check your answers and reset, to play another game or to teach your child/a friend this categories of nouns. # 2. The second game is another kind of 'pick and drag' 16 nouns into the correct groups - countable on the left and uncountable on the right. Again, you have the same choice at the end - check your answers or reset to play another game.